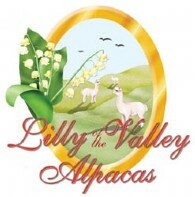 Nancy and Dennis Lilly welcome you to "Lilly of the Valley Alpacas." We are a hands-on, full time alpaca ranch centrally located in Modesto, California. We are just a 90 minute drive between San Francisco/Bay Area and Yosemite National Park. Struck by the gentleness, grace and beauty of the alpaca, realizing the tax benefits of owning livestock, then seeing the huge potential in alpacas, we jumped right in! We once had only dreamed of owning an alpaca ranch. Now our dream is a reality. We began our adventure with virtually no livestock and/or farm experience. After beginning with 6 pregnant females we immediately knew this was the beginning of a wonderful lifestyle and our herd has now grown to 48 and counting. Dennis maintains his "day" job in a very busy real estate business while Nancy, a Registered Nurse, now devotes herself full time to the alpacas. Even with our sometimes hectic schedule the time we put into caring for our growing herd is pure pleasure. There is no better way to begin or end the day than around the peace and tranquility of these enchanting animals. This truly is a rich & rewarding lifestyle. Of course, we spoil our alpacas with daily hands-on attention. Our only question is why we didn't do it sooner! Our focus at this time besides breeding for improved genetics is supplying excellent customer service and developing lasting relationships with our clients. We have worked extensively with an alpaca consultant and taken educational courses in all aspects of alpaca care and management to be better equipped to help our clients succeed. Our no pressure approach to sales is well received. We provide alpaca boarding, alpaca sales, extensive after sale support and alpaca fiber for sale.